A Night of Visionary Underground Film March 8 in London – Zero Equals Two! “The evening will consist of three slots. 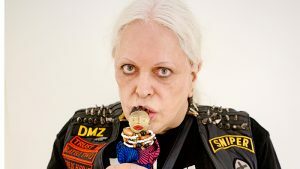 Change Itself – An Art Apart: Genesis P. Orridge is a 2016 film by Swedish director Carl Abrahamsson, and as the title suggests, is a documentary about the always interesting leader of Psychic TV, and former member of Throbbing Gristle, Coum Transmissions and multi-media art terrorist. It’s accompanied by a talk by writer AD Hitchin about the continued cultural relevance of Orridge. A tribute to Derek Jarman’s super 8 epic IN THE SHADOW OF THE SUN (1975, with music by Throbbing Gristle, 1980). Principally shot on super 8 and 16 mm film, SUB UMBRA ALARUM LUNA pays deserved respect to a highly influential film (and its maker). Previous Article← Birthday of the REAL head of The Illuminati!